LANSING (Oct. 26, 2018) — Voters Not Politicians, the ballot committee backing a new redistricting system in Michigan, took in nearly $14 million over the past three months, swamping the group that is opposed to the ballot measure. Campaign records filed Friday show the group took in a whopping $13.96 million in direct and in-kind contributions since the last reporting period ended on July 20 — drawing an avalanche of support and dwarfing the $1.68 million the group had brought in previously. The last filing before the Nov. 6 elections shows how this once grassroots-inspired effort to change how legislative lines are drawn has evolved into a behemoth drawing millions of dollars in donations from national groups. Its campaign finance filings this reporting term show that $5.5 million came from the national non-profit behind what Politico called a “liberal secret-money network,” the Sixteen Thirty Fund. Another $4.84 million came from the Texas-based Action Now Initiative, which was founded by energy hedge fund billionaires John and Laura Arnold. 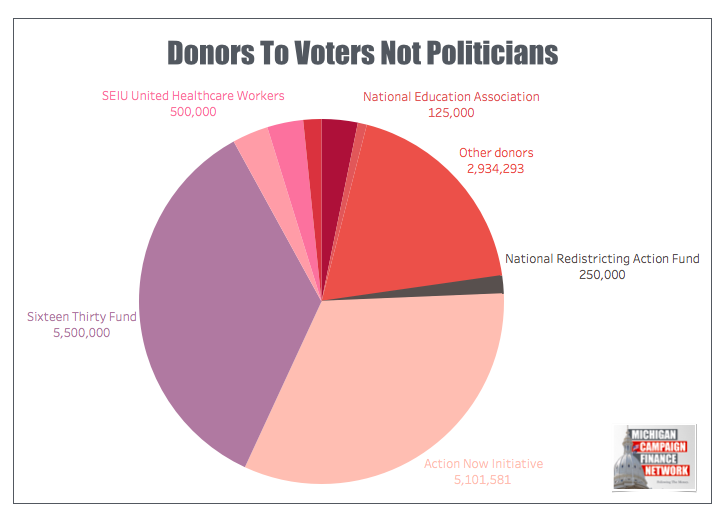 Other large donations came from the SEIU and the National Redistricting Action Fund, the nonprofit affiliate of former U.S. Attorney General Eric Holder’s group. Those large, out-of-state donations drew criticism from opponents to Prop 2. Proponents of the redistricting measure, Prop 2, pointed to their numbers of small donations in defense. Proposal 2 would take away the power to draw legislative lines from whichever party is in control of Lansing (in recent election cycles that’s been Republicans) and create a commission of 13 citizens responsible for redistricting after each decennial census instead. The commission would consist of a mix of self-identified political affiliations: four Republicans, four Democrats and five independents. Before Protect My Vote took up the mantle of fighting Voters Not Politicians, that effort was led by a group called Citizens Protecting Michigan’s Constitution. CPMC supported the lengthy legal battle that worked to keep Prop 2 off of the ballot on the grounds that it was too broad and could only be enacted through a constitutional convention. That legal effort failed, allowing voters to decide the issue on Nov. 6. CPMC stopped fundraising after the legal bid, and did not raise any money this reporting period. Protect My Vote, the ballot committee formed to oppose ballot proposals that would change the state’s redistricting system and voting practices, reported Friday that it took in $1.47 million in direct and in-kind contributions since it formed in late August. Records show the group has only spent $133,183 of that money as of Oct. 21 — all to oppose the redistricting proposal (Proposal 2) through radio advertising and bumper stickers. That doesn’t account for the significant funding that likely went into creating and circulating five new statewide TV spots. 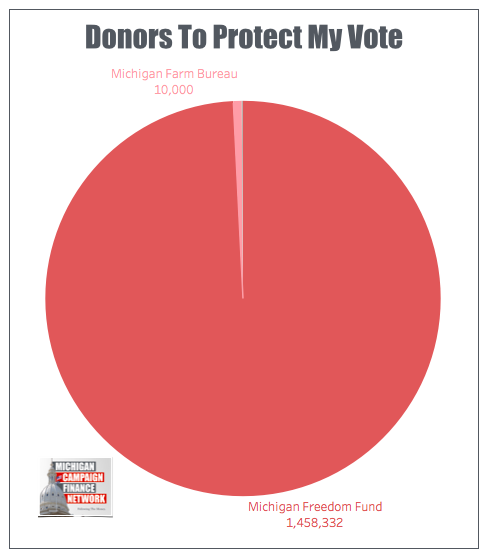 The Michigan Freedom Fund, a conservative advocacy organization, provided more than 99 percent of the ballot committee’s funding — $1.34 million in direct contributions and $119,110 in in-kind contributions such as staffing, polling, research and email service. The Michigan Farm Bureau contributed $10,000. All other individual contributions were less than $200. Proposal 3 would enshrine seven voting rights in the state constitution, including the right to vote straight party, to automatic voter registration, to same-day voter registration and no-reason absentee voting. The ballot committee behind Prop 3, Promote the Vote, which took in $2.15 million since July 20. That brings the committee’s total for the election cycle so far up to $5.14 million. Just over 80 percent of its individual contributions were $10 or less. Promote the Vote’s final campaign stretch saw big contributions from the Michigan League of Conservation Voters ($800,000), the CEO of Oklahoma-based energy company Samson Energy ($500,000) and the Sixteen Thirty Fund ($250,000). However, ballot committee’s major backer continues to be the ACLU, which has long spearheaded the efforts behind Prop 3. 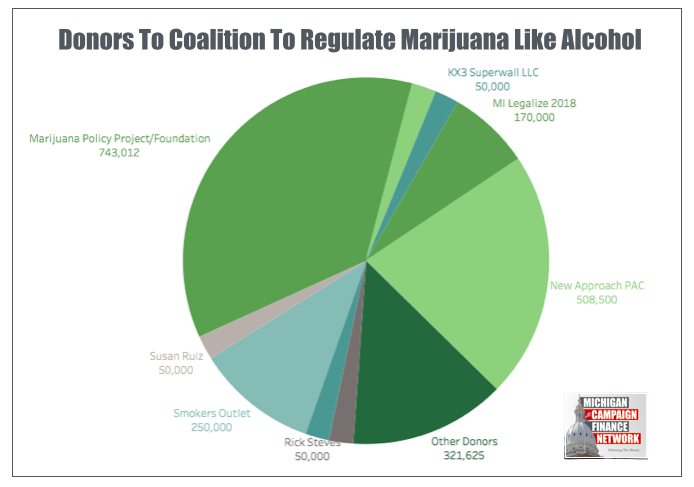 The Coalition to Regulate Marijuana Like Alcohol, the group behind Proposal 1, the effort to make recreational marijuana use legal for adults over 21, took in $529,277 over the last campaign finance filing deadline. In total, the group has collected $2.33 million in contributions this election cycle. Prop 1 would allow people to carry pot, have it at home and grow their own plants. It also outlines a 10 percent tax weed consumers would pay, which would go to schools, roads and some local governments. Nearly 80 percent of the committee’s money raised during the last reporting period came from the New Approach PAC, a Washington, D.C.-based nonprofit that advocates for pro-marijuana policies around the country. The Marijuana Policy Project, a nationally-focused pot advocacy group, gave an additional $110,000. The two groups are the largest backers of the proposal overall. The opposition group, Healthy and Productive Michigan, saw a huge uptick in contributions this period but still lags behind CRMLA in total. It reported $1.21 million in direct and in-kind contributions between July 21 and October 21 — more than three times as much as its earnings during all the other reporting periods combined ($278,561.) Since Oct. 21, it reported an additional $130,000 in late contributions, bringing its total to $1.62 million in the election cycle to date. Far and away, its biggest booster was Smart Approaches to Marijuana Action, a DC-area non-profit that gave it $1.06 million throughout the campaign cycle. That’s 65 percent of its total funding. Other large funders represent head honchos in the business and energy worlds: DTE Energy executives, the president of Meijer stores and business advocacy group Business Leaders for Michigan are all among the top contributors.